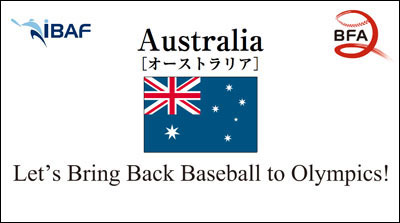 Baseball fans and players will see the message of the IBAF and the Baseball Federation of Japan that supports the campaign to bring back baseball to the Olympics on the giant scoreboard of the Tokyo Dome during the 2 charity matches on March 10. The first match (played by japanese amateur players) starts at 12:00 (Tokyo time) and will be played by the All Star teams of thr Industrial Leagues representing JABA and College, and the professionals game is scheduled at 18:25 when Samurai Japan of NPB will take on All Stars of Chinese Taipei. The short slogan in 11 different languages with the respective National Flags will appear in this sequence: Japan, Chinese Taipei, Korea, China, Pakistan, Australia, France, Italy, Netherlands, U.S.A and Brazil. A short version of the same Video will be shown at the 4 Exhibition Games that the Seattle Mariners and Oakland Athletics will play against Tokyo Yomiuri Giants and Osaka Hanshin Tigers at the Tokyo Dome of March 25 and 26.